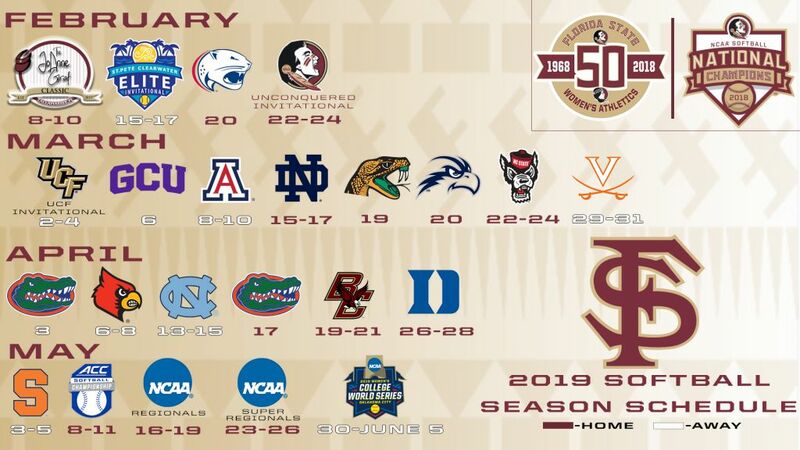 TALLAHASSEE, Fla. — The 2018 National Champion Seminoles have again put together a strong regular season schedule as head coach Lonni Alameda has announced the 55-game schedule for the 2019 season on Tuesday. Florida State ended 2018 with the No. 1 RPI, No. 1-ranked out of conference strength of schedule and No. 3-ranked overall strength of schedule and the Noles will test themselves again in 2019 as eight opponents ended 2018 ranked or receiving votes in the NFCA poll, including No. 4 Oklahoma, No. 5 Florida, No. 9 LSU, No. 10 Tennessee, No. 11 Arizona, No. 21 Minnesota, as well as Ohio State and Notre Dame. Over half of the non-conference opponents on the 2019 schedule (12-of-22) finished 2018 in the Top 75 of the RPI. New for the 2019 season will be the start of ticket sales for home games at JoAnne Graf Field. Specific details will come later, but there will be season ticket packages available, as well as the ability to buy tickets on a per game basis. The 2019 season will unofficially start on February 2 with our FSU Fan Day at 2:00 p.m. There will be numerous events happening at JoAnne Graf Field throughout the afternoon, including the ability to meet the players and get autographs signed. The regular season will start on February 8-10 with the inaugural JoAnne Graf Classic. FSU softball will honor NFCA Hall of Famer Coach Graf with a tournament in her honor as UNC Wilmington, UNC Greensboro and Iowa State come to Tallahassee for the three-day tournament. Florida State will then travel to Clearwater, Fla., to be part of the 2019 St. Pete/Clearwater Elite Invitational, hosted by ESPN Events on February 14-17 at the Eddie C. Moore Complex. The four-day invitational will consist of 16 teams, with 13 of them that finished in the Top 25 of the RPI at the end of the 2018 season. The Seminoles will play six games in three days at the invitational, taking on Ohio State and Oklahoma on February 15, LSU and Minnesota on February 16 and closing out with games against FAU and Tennessee on February 17. The games of the invitational will be broadcast on the ESPN family of networks, including many on ESPN, ESPN2 and ESPNU. FSU returns home for a midweek game against South Alabama on February 20 before hosting the Unconquered Invitational on February 22-24. The Seminoles will host Elon, Lipscomb and Samford in the three-day tournament. The Noles will head to Orlando for their final tournament of the non-conference schedule and play Toledo, Louisiana Tech, Dartmouth and UCF in the UCF Invitational on March 2-4. Florida State heads out west for the first full week of March, with a road doubleheader at Grand Canyon on March 6, before heading down to Tucson for a three-game weekend series at Arizona on March 8-10. The 2019 ACC schedule begins in Tallahassee on March 15-17 as the Noles host Notre Dame. FSU follows with midweek games against Florida A&M (March 19) and UNF (March 20) before NC State comes to town for a conference series on March 22-24. Three straight ACC road series follow with Virginia (March 29-31), Louisville (April 6-8) and North Carolina (April 13-15), with the first game of the annual Fresh From Florida Sunshine Showdown at Florida on April 3. The Gators will come to Tallahassee on April 17 before the Seminoles close out the home regular season schedule with series against Boston College (April 19-20) and Duke (April 26-28). The final regular season series will be at Syracuse on May 3-5 before Florida State hosts the 2019 ACC Softball Championship on May 8-11 at JoAnne Graf Field. Broadcast and ticket information for the 2019 season will be announced at a later date and all relevant information will be placed on the softball schedule page of Seminoles.com.